Breakfast, is the first meal of a day which means breaking the fasting period of the prior night. Breakfast is the most important meal of the day. Breakfast dishes varies from countries to countries depending upon the culture, people and availability of local grains, vegetables and fruits. Earlier am not a breakfast person, i usually drink a coffee or tea and eat directly my lunch. But now i enjoy making my breakfast before leaving to work as i cant skip my breakfast now.Obviously I do wake up earlier to finish my breakfast so that am not in hurry before quitting home. Now i cant go out without having my breakfast. After a 26 days of blogging marathon, am kick starting our routine three days of blogging marathon from today. Its been a fun filled September, learned so many new flatbreads and my bookmark list is overflowing as my fellow bloggers came up with tremendous flatbreads during the whole month of September. I have so many interesting flatbreads to dish out, hope i will cook one by one very soon. Am running this week's blogging marathon with Easy Breakfast Dishes as theme, yes we are back to our usual 3 days of blogging marathon. And am kick starting this week's theme with a simple,easy,quick and yet a filling breakfast. 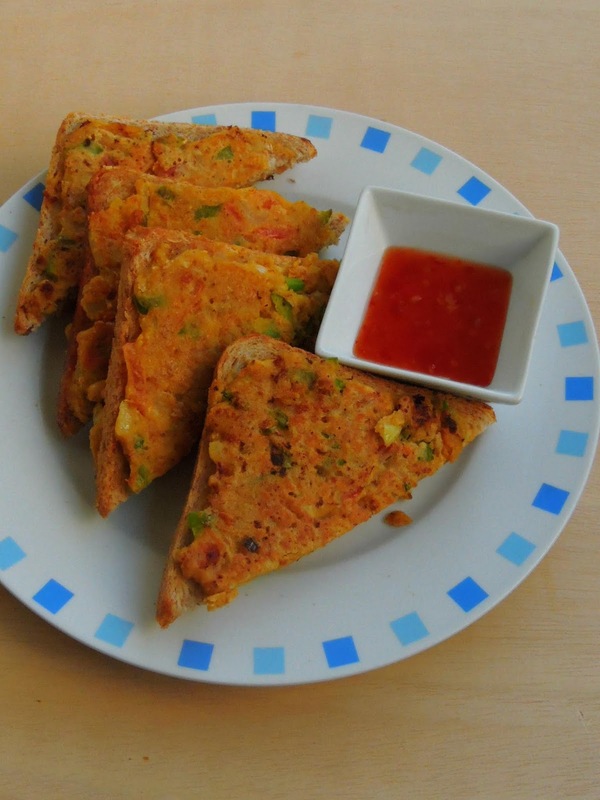 Yes today's breakfast dish is vegetable loaded besan- oats bread toast. 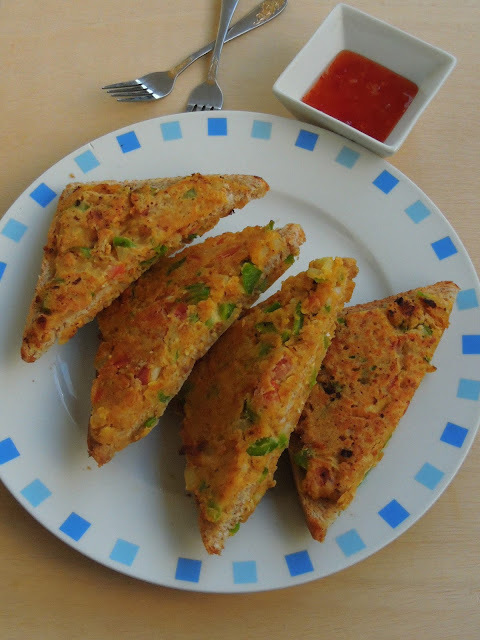 Besan means Gramflour, though many of us makes simple besan bread toast often to finish a breakfast quickly, i opted for an interesting and healthy version of toast. 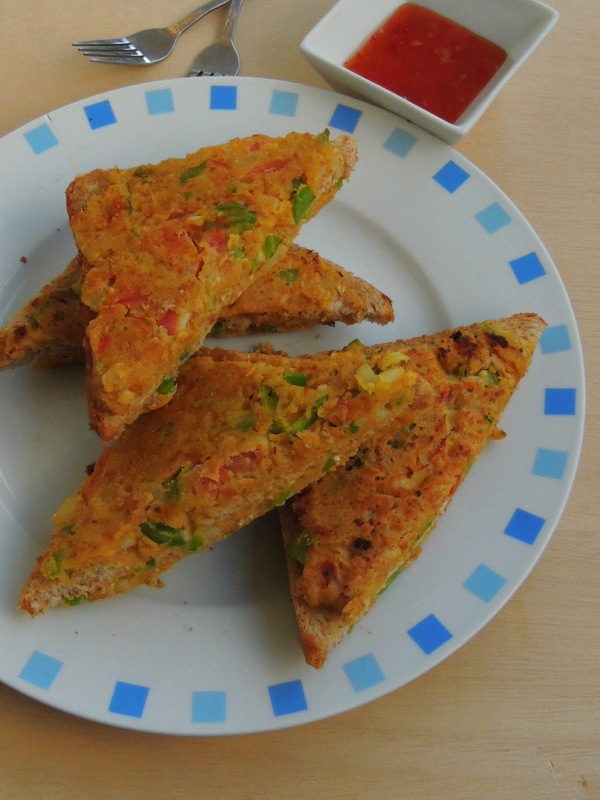 This besan toast have couple of vegetables, rolled oats which makes this bread more healthier, colourful and quite filling. Very easy to make, one can finish their breakfast easily with a slice of this bread toast and a cup of coffee. Yes trust me, this toast is really very filling and quite satisfying at the same time. Take the gram flour,rolled oats, chopped onions, chopped tomatoes, chopped capsicum, red chilly powder, salt turmeric powder in a bowl. Add enough water and mix as a semi-thick mixture. Take care not to add more water, we dont want a thin batter. Meanwhile heat a tawa, drop enough oil. Now spoon the besan-oats mixture to both sides of the bread and give a press gently, drop the bread slice to the hot tawa. Cook in simmer. Drizzle some oil and cook on both sides until they turns golden brown. Continue the same process with the remaining bread slices. Serve hot with ketchup or any sauces of your choice. This is such a delicious breakfast Priya!Adding oats to besan makes it all the more tempting! Wow this veggie loaded toast looks awesome Priya. With besan and oats on the batter, this would make a filling meal.. Adding oats to the recipe definitely makes it a healthier one. Good one, Priya. That is such a delicious savory breakfast Priya. Love the addition of oats along with besan in there. That is such an interesting way to serve a sandwich. Love the recipe Priya. My older one comes home starving and I am thing of making to him right then. A healthier and delicious variation to the regular bread toast. Kids will certainly fall in love with these toasts. 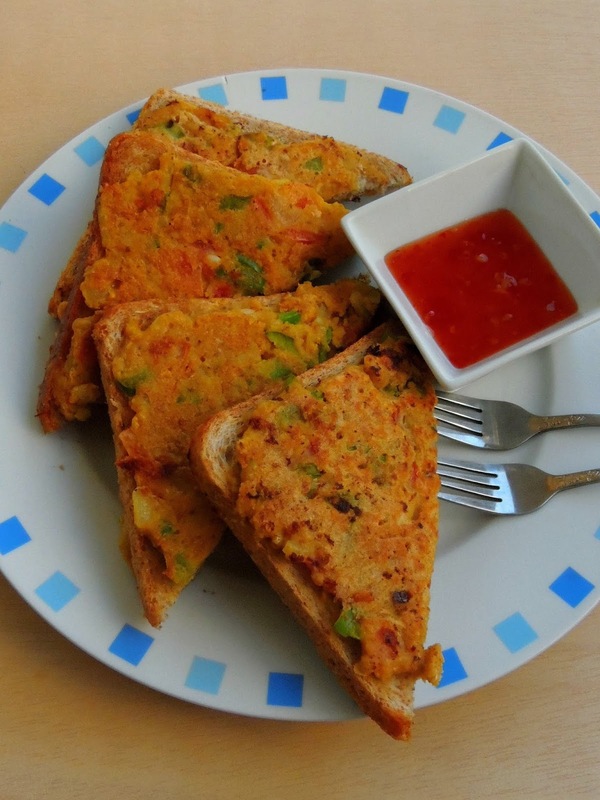 The oats addition is a lovely touch to the already healthier besan toast. Makes a lovely breakfast. That toast looks great Priya, will surely have this bookmarked, always a boon to make note of such easy breakfast dishes. Wow this is nice and innovative, adding oats and gram flour to a bread makes it filling as well as nutritious.